Join the vassals for the second meeting of the VOK Book Club. 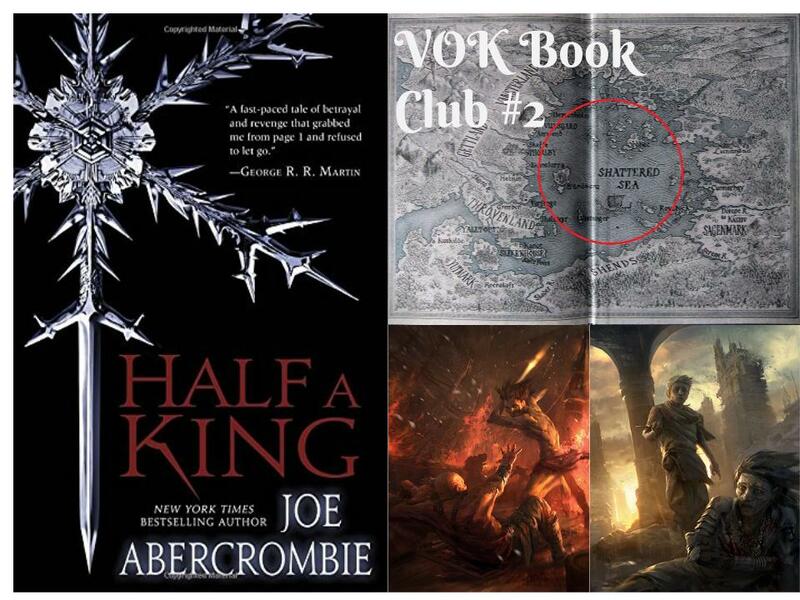 We review and discuss Half a King by Joe Abercrombie. Join hosts Greg (claudiusthefool), Amber (amberrocks), Brett (White Raven), Alix (Aiwendil) and Duncan (Valkyrist) as they review the first book of Abercrombie’s planned Shattered Sea Trilogy. A high fantasy adventure of epic proportions full of betrayal, vengeance, slave revolts, pirates, savages, ancient ruins and blood oaths. Unshackle your slave collar and join us on our sojourn around the Shattered Sea. Jacket image and map taken from the US Hardcover Edition published by Del Rey 2014. Artwork by Jon McCoy from the Subterranean Press limited edition. This entry was posted in Books & Novellas, Podcast and tagged Aiwendil, amberrocks, claudiusthefool, Valkyrist, White Raven. Bookmark the permalink. You motherfuckers… I can’t listen to this until about 2017 when i’ve marathoned the whole trilogy because having to wait in between books will wreck my life. I have to be realistic about these things. Curse you for dangling this in front of me like a ripe, juicy blood orange. For a post that started with “You Motherfuckers” I thought that ended well. Glad you are interested and I’m sure if you listen to it you will forget everything about it by 2017. But I understand waiting until the series is over with. Since I know nothing about the plot of this book, anything could be a spoiler to these sensitive ears. So this one is going deep into the podcast vault for me, haha. And yes… ‘motherfuckers’ is a term of endearment.